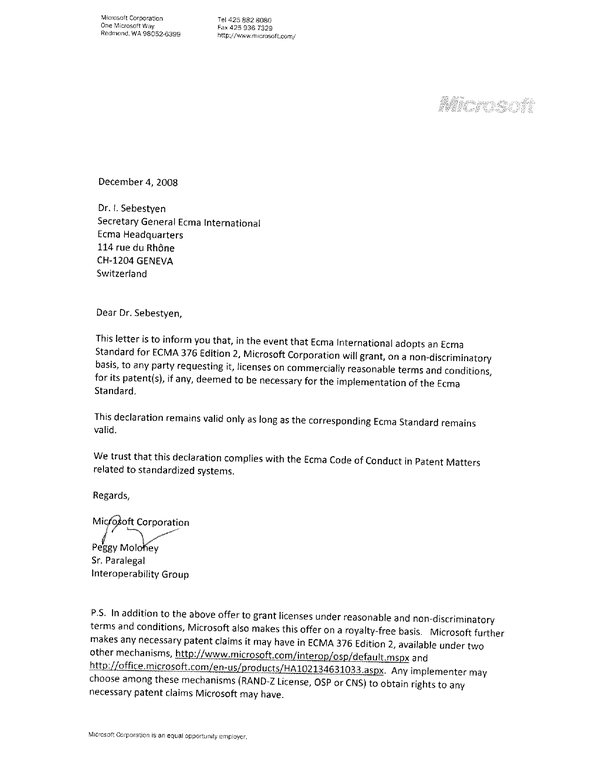 Forum » News / Front-page » Microsoft excludes competitors with OOXML patent license? ECMA has just published two documents related to the patent licensing of ECMA376v1 and ECMA376v2. Microsoft promises to give a patent license under so called "reasonable terms". Reasonable for whom? ECMA has just published two documents (letter1 and letter2) related to the patent licensing of ECMA376v1 and ECMA376v2. Microsoft promises to give a patent license under so called "reasonable terms". Reasonable for whom? If you have some time, you could transcript it for blind people and bloggers to quote it. We have requested a commercial patent license in July, but radio silence since then on the Microsoft side. Yet another proof that the patent system does not work. The General Assembly of Ecma shall not approve recommendations of Standards which are covered by patents when such patents will not be licensed by their owners on a reasonable and non-discriminatory basis. In case the proposed Standard is covered by issued patents of Ecma members only: Members of the General Assembly are asked to state the Company licensing policy with respect to these patents. I wonder what the latest requirement means. Nobody knows exactly which Microsoft patents covers the specification. Nobody has ever seen the list. Re: Microsoft excludes competitors with OOXML patent license? It is not common to disclose the number of patents. In fact industry players generally see that as a disadvantage. Standards are made for the people and the market, not for "industry players". But Standards Organisations are usually captured by vendors, as we saw during the OOXML debate at the BRM notably. It is not common for those parties which license their patents for an international standard. This is why you have indemnification models. I guess Simon Phipps once explained quite convincing why it is important.